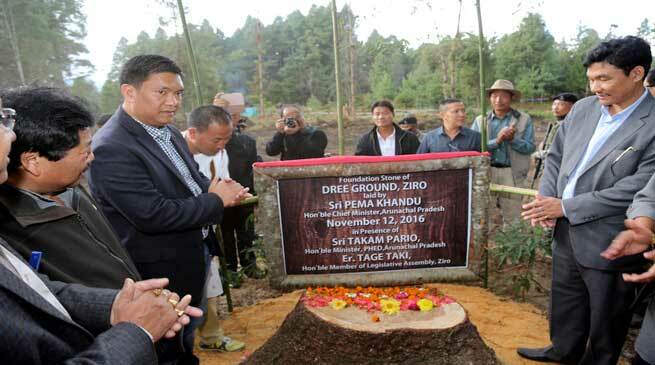 Chief Minister Pema Khandu today laid the foundation stone for central Dree ground here at Biiri village in his maiden visit. The central Dree celebration celebrated since 1967, was being held at Hija Govt. Higher Secondary School playground, and the Central Dree ground was a long felt need of the Apatani community. The Chief Minister was presented with traditional Apatani Shawl and machete by the Gaon Burah Association and Central Dree Celebration Land Donors.Speaking on the occasion, CM Khandu thanked the land donors for donating land free of cost for central Dree celebration. He assured all help from the state government for land development of the Dree ground informing that currently Rs 1 crore under SIDF is being earmarked to be spent for the purpose. The Chief Minister also assured to fulfil the demands made by the Gaon Burah Association in its 3-point memorandum. He said a cabinet decision will be take on the matter, which the Chief Minister said will benefit the Gaon Burah institutions in the state. Responding to the memorandum of Apatani Students Union (ASU), CM Khandu said there is immense pressure from the centre to start work on Potin-Pangin road of the Trans-Arunachal highway. He pointed that land compensation issue is proving to be a major impediment in completion of the crucial highway connecting Itanagar with Ziro, Raga and Daporijo. The centre has categorically written to state government to clear the pending land compensation issue or it will be forced to cancel the funding, informed Khandu. The Chief Minister appealed the people to accept land compensation rate as per the norms and not to make exaggerated claims. He said people have to make choice, if they want speedy development or want to stick to their demands for land compensation. The Chief Minister said his late father Dorjee Khandu, the former Chief Minister enjoyed good relations with Ziro people. He promised to continue the good relation and appealed the people to support the state government as he wants to take the state to new heights. The Programme was attended by PHED Minister Takam Pario, Hydropower Parliamentary Secretary Phosum Khimhun, Raga MLA Tamar Murtem, Ziro MLA Tage Taki, Commissioner (PWD) Hage Khoda, Commissioner (PHED) HK Shalla, Chief Engineer PHED (West Zone) Toko Jyoti, Ziro DC Kemo Lollen and other dignitaries.